Yeeey!!! I just opened my own Flickr page!!! I just posted 1 photo on it for starters - just to test if it works - and it does!! So, from now on, the photos you see on my blog might also appear on my Flickr page, or vice versa. Here's MY FLICKR !! It's also added to my "Links" section of my blog. And don't worry - more photos will appear on it soon! 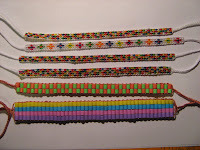 During the holidays I have been making bracelets of all kinds. 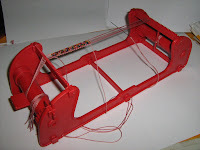 First, there are the ones that I make with the help of a special frame (the red device on the first picture). 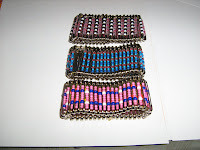 The second photo shows some of the bracelets I've made so far and the last 2 photos are closeups of a bracelet made with Hama pearls and one with some very small beads (each about 1 mm in diameter). The small beads actually look like little diamonds! 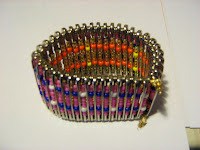 My second project are safety-pin bracelets. 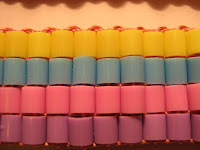 I learnt to make them many years ago - a friend from Holland showed me how to make them. At that time these were not known in Slovenia, so, in a way, started the trend. As you can see, on the second photo, I make them double-sided (so that I have 2 bracelets in one), although it's perfectly fine to make them single-sided, as well. 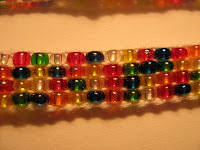 If any of you want to learn how to make these bracelets, feel free to ask for instructions and I'll post them here (hopefully with photos to accompany each step)! Yesterday evening I was watching the TV series "Kommisar Rex" and eating peanuts. 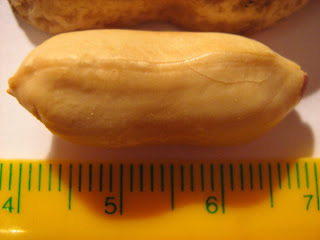 They were just regular peanuts, bought in the store, but already there I noticed that they were quite big. However, I didn't have the slightest idea of what I was going to discover. During the TV show I just cracked each of them open and didn't really look at them, until I came to one particular nut that was very hard to get out of the shell - naturally, I looked at the "problem" I was facing. I carefully removed the shell, paying attention not to crush the seed inside. And it's a good thing I did so, because this baby came out!!! I just had to take a photo of it and show it to the world!! And, no, this is not a trick or a photo montage. You see, I have a new camera that enables me to take photos like this. So, here's The Big Mamma (as I named the peanut)! If any of you can beat my record, let me know, but I think that a 3 cm-nut is the absolute champion!! !